Overall I performed great today. 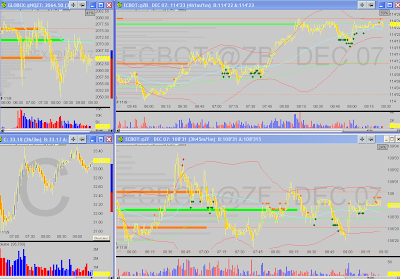 Today I traded much better, scalping good chunks out of ER2, YM, and ZF on 1-2 contracts. I waited for my trade signals and I told myself I wouldn't add to losers with more than 2 contracts total (a risk management strategy I use to apply when I was trading smarter). There was an interesting relationship between the 30yr and 2yr bond futures this morning. Instead of ZF leading to the upside, ZB was leading. 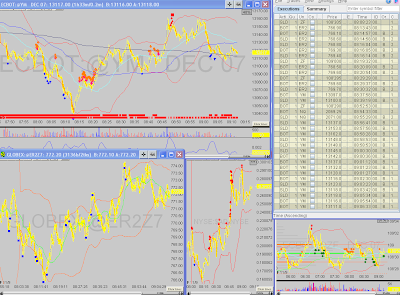 I watched for bearish divergences between ZF and ZB to take short trades on ZF back down to VAL/POC value areas. I watched for bullish climax points in the bond futures(ZB/ZF) and waited for the inverse trade signals on ER2 and YM to take mostly long scalps. (intermarket relationship) I also noticed a BID on NQ around 2055 and resistance on ZB around 8:15am. I also notice a tendency for climax points on Fridays to be around the 8am hour, which may have relevance considering the overseas markets close at 8am and because bond futures have a shortened trading day on Fridays. Thanks to StockHunter for the comment which included the link to this great article on Risk Management which I read last night. i caunt wait fur anuther bloewup.